Spencer Savings Bank is committed to ensuring your debit card is protected in every way possible. As part of our ongoing fraud monitoring program, we are implementing two-way text alerts to detect suspicious activity in real time. Debit card fraud is one of the most pervasive and disruptive types of payment fraud today. It is also one of the most troublesome, because the funds are withdrawn directly from the customer’s checking account. Spencer takes many measures to protect your personal and account information, but we need your help to close the loop. With two-way text alerts, we can use text messages to confirm or deny suspicious transactions, immediately taking the necessary measures if a transaction is determined to be fraudulent. 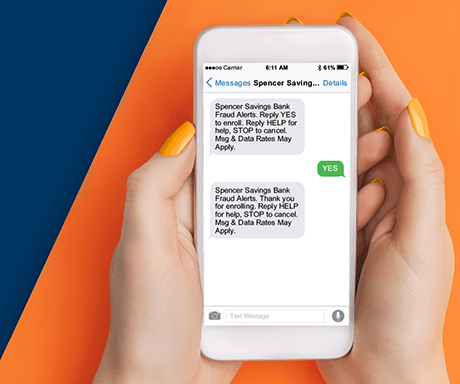 The saying goes, “An ounce of prevention is worth a pound of cure.” Two-way text alerts allow us to not only identify fraudulent transactions, but also stop them in their tracks. Rejecting these transactions is much more efficient than investigating them later on. Meanwhile, putting a hold on your card prevents any further fraud. We will watch for suspicious transactions. If a suspicious transaction is detected, you will receive a text message. Respond via text to confirm or deny the transaction. If you deny the transaction, we will instantly respond with a number to call our fraud monitoring department. That’s it! Simple, quick and easy. If we have not received a response after 15 minutes, we will call you directly. If we are unable to reach you, we will put a hold on your card—just to be safe—until you contact us. Current customers: Opt in when you receive our launch message on 10/15/18. New customers joining Spencer after 10/15/18: You will receive an opt in message shortly after activating your ATM Check Card or ATM Business Check Card. If you miss or believe you did not receive an opt-in message: Call the number on the back of your card and request two-way text alerts. Have questions about this new feature? Contact our Customer Service Center at 1-800-363-8115.